In 1976 Colin moved from Wembley to Wells in Somerset. Taking care to find a property with an outbuilding for use as a workshop and a garden suitable for a railway. 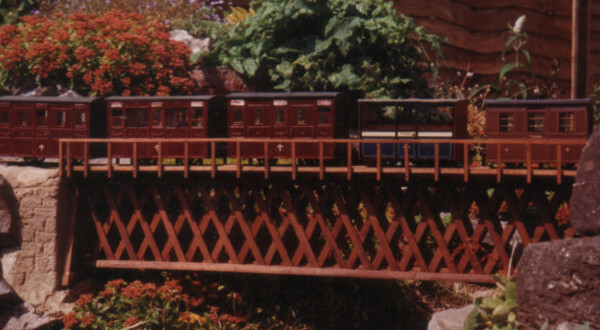 Construction of the garden railway did not start until 1983. A new hobby, exploring the extensive local caves, distracted Colin for a while. As did problems with the house and workshop. There was also the planing permission problem. At the time Colin's wife Marjorie viewed his model railway activities with some justified suspicion. There was a moulding machine on the dining table because there was no room for it in the workshop. He had been caught metal casting in the kitchen. Caught using the grill as part of his vacuum forming rig. Broken the food processor making 009 track ballast out of corks. He had even attempted `explosive forming` in the garden. Before you think me to harsh on my poor old dad do read Colin`s article on centrifugal casting. The final straw came when Colin attempted the clearing of a blocked sewer with explosives. Causing the sewer to collapse. Hell hath no fury like Marjorie denied her lavatory . With the sewer incident the era of Bodger Binnie`s experimental engineering came to an end. Colin realised the only way there was going to be a garden railway was if he regained Marjorie`s trust, kept engineering out of the kitchen and cleared the jungle. Central heating, double glazing and a new kitchen might also have helped soften Marjorie`s attitude. 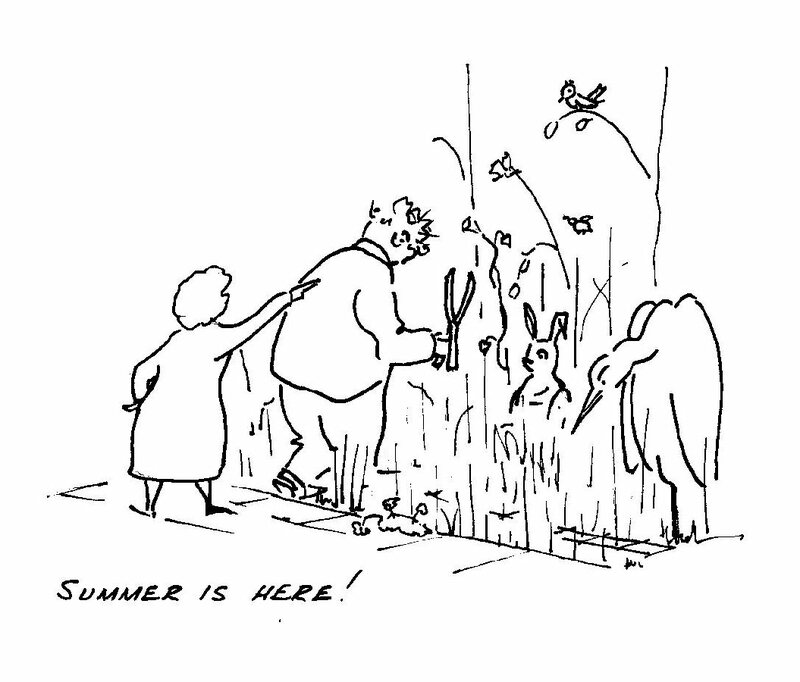 So it was that Colin`s sons, Robert and Peter, transformed the wilderness of nettles and brambles into a proper flower garden. 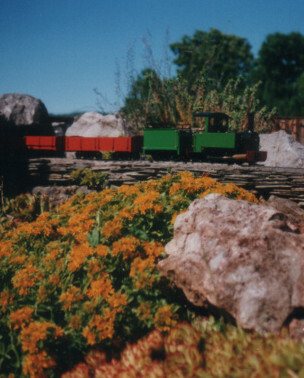 But of course, a flower garden with rockeries just the right hight and in just the right places to take the trackbed of a garden railway. With the garden now respectable Marjorie`s objections faded and planing permission was granted. As novice gardeners we made many costly mistakes. If you are contemplating the construction of a garden railway do seek advise from 16mm Association members who have already built one. Save yourself loads of trouble, mistakes involving tons of soil, rock and concrete are difficult to rectify. The garden was to the north of the house about 30 ft wide and 100 ft long, sloping gently away from the house. The far end about 5 ft lower than at the house. If the track were elevated by 3 ft at the far end it would be at ground level crossing the path by the shed. 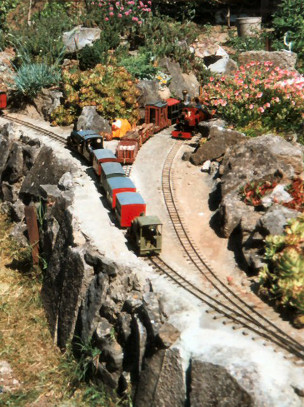 Limestone forms much of the rockeries and trackbed as it is readily available in Somerset. Much of the stone came from Colin and Robert`s involvement with cave digging. Caves are often choked with rubble which has to be removed to enable further exploration. The stone being unwanted Colin brought it home. The garden was divided into three parts. The third nearest the house contained the workshop and shed. Damp and usually in the shadow of the house it was laid to patio providing a shady seating area in the summer. Though home to the usual collection of garden tools and junk the shed was large enough to accommodate a good sized steaming or loco preparation bay. With large windows overlooking the railway it provided a comfortable refuge should the weather turn nasty when running trains. Construction started in the central third of the garden with a simple loop. Concerned the track would get damaged by foot and wheelbarrow traffic where the line crossed the garden path at ground level. The crossing tracks were made of two lengths of inch by quarter stainless strip bolted to 32mm spacers. The assembly buried in the wet concrete level with the path surface. Clearance between the rails for the wheel flanges being scraped in before the concrete hardened. Little more was done to the railway until Colin retired. By then the central rockery had sunk a couple of inches and frost had disturbed the once level track. Colin repaired the damage and set about extending the line to the far end of the garden with a second loop. On the east side of the garden a concrete viaduct lead to yet another rockery which continued to the brass bridge in the north east corner. Having suffered considerable subsidence with previous rockeries the North East one was constructed differently. A block wall with proper foundations was built to support the track bed. Then rock and soil piled up against the wall. The rock and soil might settle over the years but hopefully the wall will not. On top of the wall a concrete trackbed about 150mm deep was cast in shuttering. Before the concrete was poured the front face was lined with slate scraps collected from the architectural salvage company`s slate trimmer. The result is a fair representation of a Festiniog embankment. Cost little and so easy to do. The elevated section crossing the north end of the garden is constructed of paving slabs on block piers. Station in the north west corner. The second loop is then completed by a single track atop a block wall leading back along the west side to the central rockeries. The two loops shared a single track across the wooden bridge. At open days with trains running on both loops it soon proved tiresome to keep changing the points. 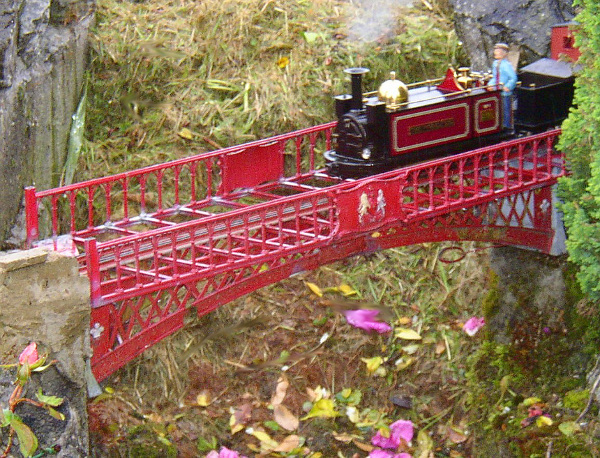 Sadly the wooden bridge had to be replaced with a more practical though less elegant dual track steel one so that both loops could run independently. Map represents the railway before the wooden bridge was replaced. Most of the track was by Tenmille. The points were made of Bonds flat bottom rail soldered to brass rail plates spiked to wooden sleepers. Other home built track is spiked down with Peco spikes passing through pre-drilled holes in small brass railplates. The plates do not take long to make and hold the spikes close to the rail. The track was laid on a concrete bed. leveled with slivers of slate then secured by in a thin skim of cement. This was durable but did not shed water well encouraging an excessive growth of moss which often took hours to clear. A mistake not to repeat. The harsh white appearance of fresh concrete was made to look more natural by painting it with urine which encourages moss, lichen and other biologicals to grow and make it look more like natural stone. Don`t be squeamish some of my organic friends put a mix of 10 water to 1 urine on their vegetable gardens. The stone effect walls behind the station were cast in cement using a rubber car mat as a flexible mould. Colin built both the bridges. The `Tan-y-Manod Viaduct` style wooden bridge might seem complicated but was a lot easer to make than you might imagine. Under the deck is hidden a length of two by one with slots to take the deck ribs. The sides and deck are just glued to that same two by one. As it crossed the garden path it had to be removed when not in use so need not be weatherproof. With the Brass Bridge I think Colin`s enthusiasm got the better of him. In plan it is trapezoidal so the two girder arches are of different lengths and curvature making the stays between them somewhat complex. The coats of arms on the bridge are from brass army badges with the backs filed off. It`s all brass with soft soldered joints. Not as durable as one might have hoped. Perhaps silver soldered steel construction would have been a better choice and no more difficult to do. Colin`s main interest was loco building and making models not so much operating a model railway. He did enjoy running trains but only in the company of other enthusiast. The gardens exposed location, known locally as windy ridge , combined with Somerset`s ample rainfall also conspired to keep Colin inside. 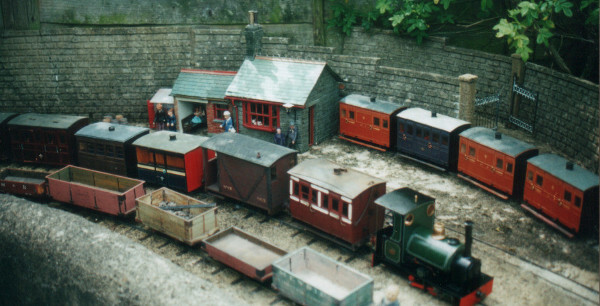 The railway did see service as a test track and when visiting 16mm modellers brought loco's to run. Colin and Marjorie thoroughly enjoyed hosting an open day in June each year. Always great fun and very well attended. How a garden railway changes a man and changes a garden. Before the railway Colin would go to almost any length to avoid gardening. I was not joking when I said this really was once a jungle of nettles and brambles.